Over in Japan, the location test of Arc System Works’ Guilty Gear Xrd was well underway, and with it came the reveal of returning favorites. First up is the anchor wielding May, followed by the massive Potemkin, who’s either sporting a full suit of armor or has gone fully robotic. Chipp Zanuff and Venom also make a return as well. The pictures from RadioKaikan also show off other characters as well, like Jam and Bridget, though it’s possible that it’s just promo material for Guilty Gear in general and not specifically for Xrd. Still, it’s a safe bet that they’ll be coming back as well. Guilty Gear Xrd is the first game in the series to use the Unreal Engine, and it’s using it in way you wouldn’t expect. While what you see in the initial trailer and in the pics from the location test might look like 2D sprites, the character models are actually in 3D. In other words, it’s cel-shading that resembles sprite work. Pretty impressive if you ask me. You’ll see what I mean if you look at the “You Rock” and intro/victory screens taken by Famitsu. You can check out some more screens after the jump. I want to say this is a victory animation, but the text on screen suggest that the battle hasn’t started yet. Obviously this isn’t all the characters. It’s a location test afterall. Here’s May again. I’m guessing this is the game’s intro sequence. 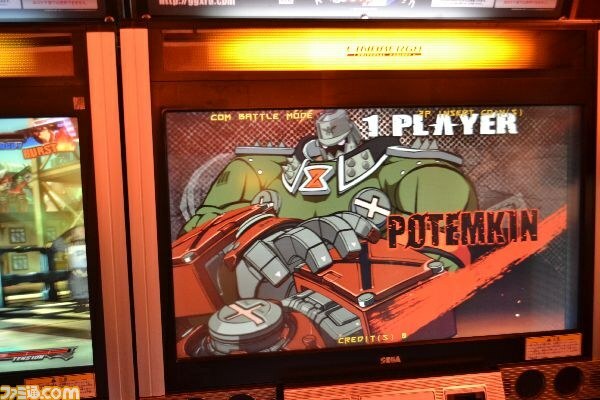 This entry was posted in Gaming News and tagged arc system works, Daisuke Ishiwatari, Guilty Gear Xrd, Ky Kiske, Location Test, May, Millia Rage, Potemkin, sega, sega sammy, Sol Badguy, Venom on August 9, 2013 by Steven T..